Exterior package damaged during transit, but that's okay, it's what's inside that counts. I'm perfectly content with my cow brown eyes. However, colored-contacts are a fun way for me to enhance my makeup looks. 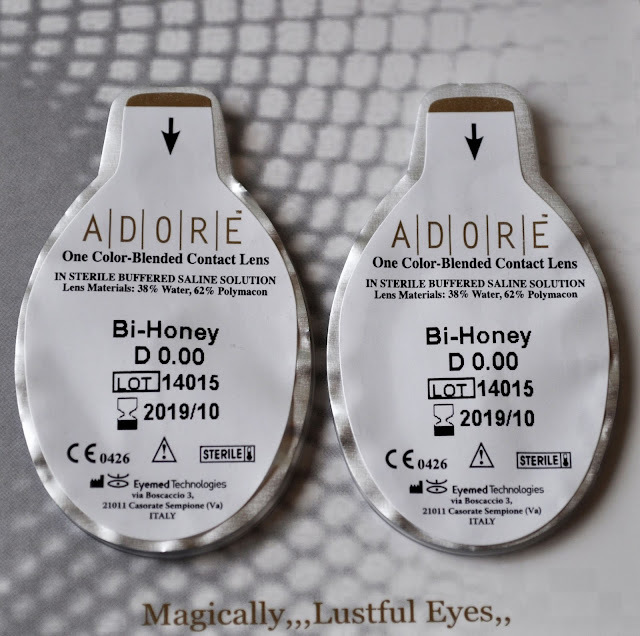 I've tired several colored-contact brands, and by far, the most comfortable and "natural" looking have been Adore's Bi-Toned Colored Contact Lenses. These lenses don't blur my vision, slide all over the place, cause any redness or excessive dryness; when I'm wearing them, I really don't feel them at all. 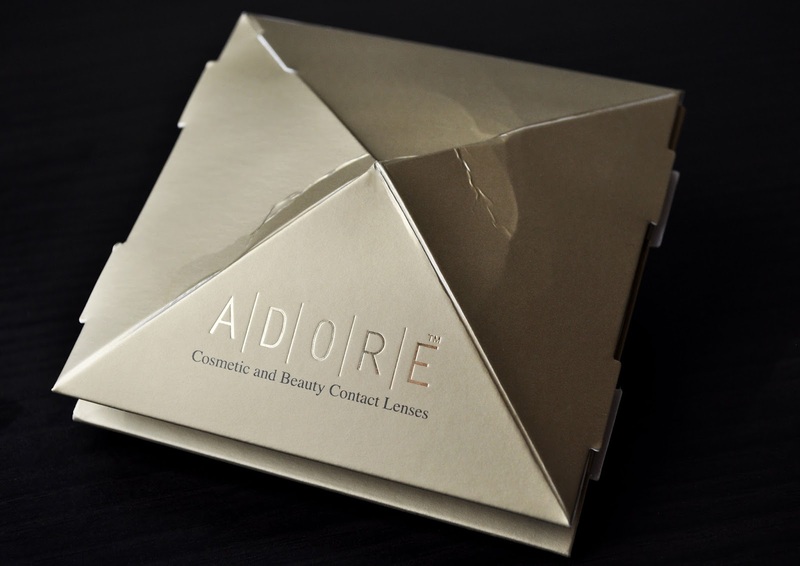 Adore Bi-Tone are 3-month lenses. I don't wear them everyday, and I'm very vigilant about cleaning them and changing their solution; so, I can get an extra month of wear out of them. The Bi-Tones have a 8.6 Base Curve and a 14.0 Diameter. I don't need to wear contacts for corrective purposes; so, I get them in 0.00 plan-O-vision. Honey is a favorite during the Fall and Winter. I love the amberish-hazel coloring of Honey; it brightens my eyes, and amplifies all the makeup shades I relish wearing during both seasons. Adore Bi-Tone contact lenses retail for 29.75 euro and I get them from lensmarketplace.com. I've been shopping there for years, and I've never had a problem (knock on wood). lensmarketplace.com ships worldwide and offer two forms of shipping (standard and express). I've always gotten my order within 9-10 days; therefore I've never had to opt for express shipping. If anyone can recommend a great pair of amber/honey contacts, as well as their favorite colored contacts, please leave your message in the comments. I'm always up to try new shades and brands. My favorite contacts are actually the FreshLook One-Day in Gray and Pure Hazel. I have brown-black eyes and they show up very well over my eye color, and they blend well enough that they don't look super painted on. My perscription isn't that strong so I only need to wear glasses when I go out, which doesn't happen all that often. As a result, I wear contacts only occasionally, which means the dailies are perfect for me. They tend to be thinner and more comfortable to wear as well. The only complaint I have is that they don't correct my astigmatism (-0.50 in both eyes), which means in order to see properly I'd still need to wear glasses even when I'm wearing contacts that correct my myopia. I've used the freshlook contact before, and they are great! Especially the gray and hazel shades. The adore bi-tones are some of the most comfortable lens I've ever worn. I wish they had a true Amber shade, that would be perfect!